The Anhinga from Sunday came back on Monday, and thoughtfully presented me with a different angle to capture. 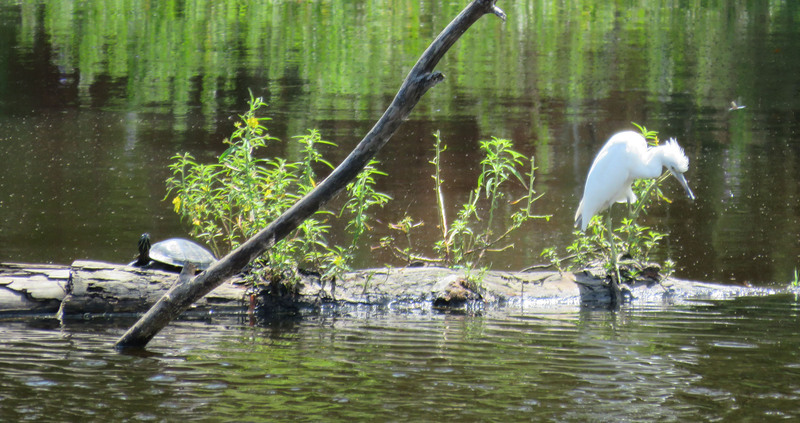 That same day, the juvenile Little Blue Heron and a Great Blue Heron landed on that same fallen tree. I went looking through my pictures and found some of the other visitors that have rested there over the years. 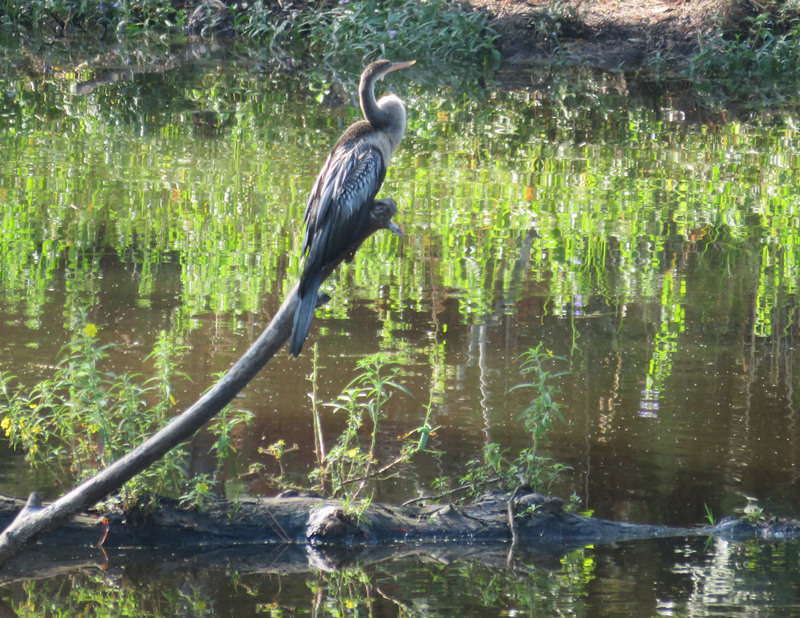 The Anhinga returns, 10 AM on 9/7/15. Juvenile Little Blue Heron, 1 PM on 9/7/15. 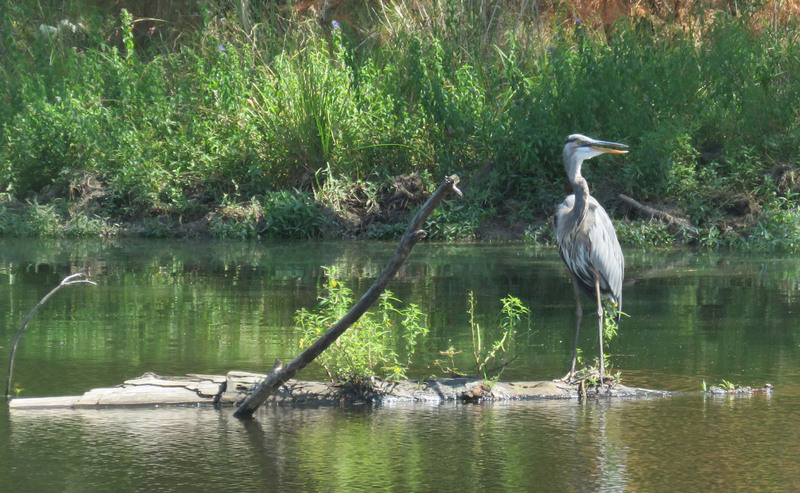 Great Blue Heron, 3 PM on 9/7/15. 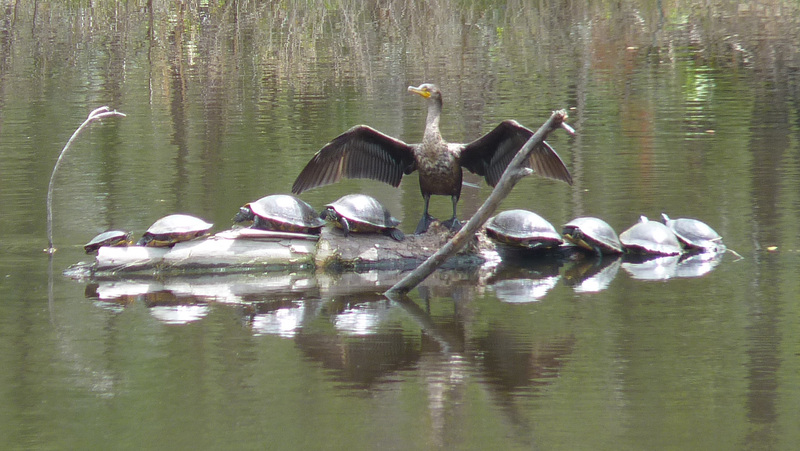 A cormorant and turtles on 3/22/2013. This picture always reminds me of a choir leader in big robes, with a group of choristers. 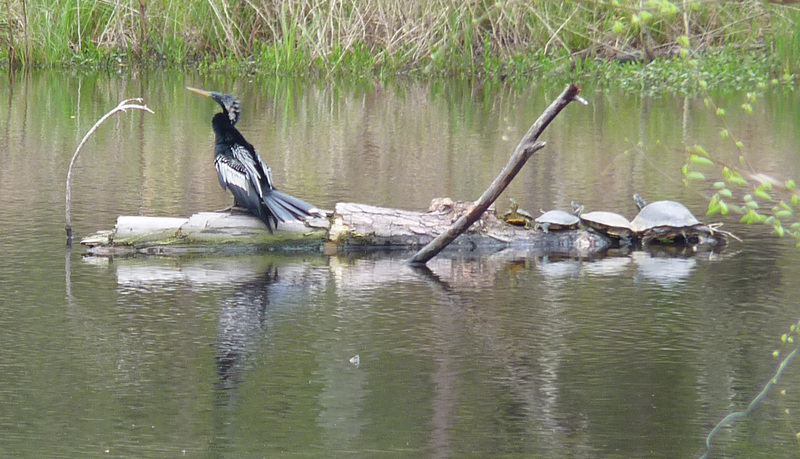 This gorgeous male Anhinga landed on 4/3/2013. 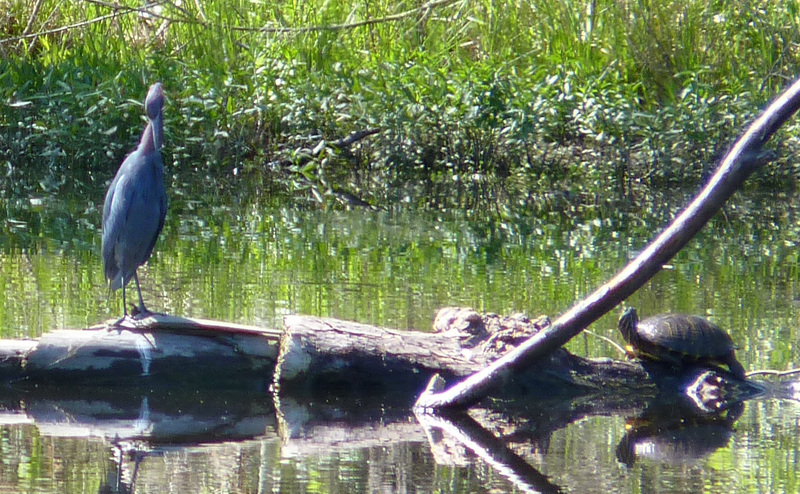 This Little Blue Heron visited on 5/7/2013. This is not the best picture, but I couldn’t leave it out. 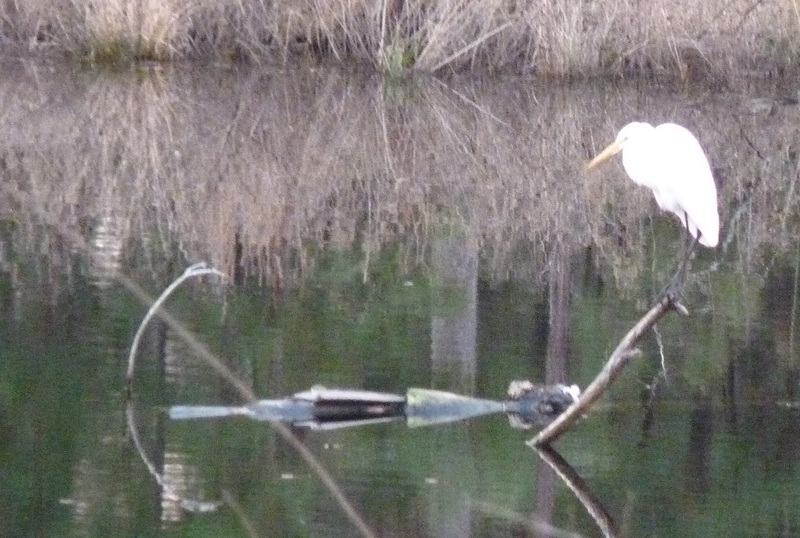 This is a Great Egret on 1/22/2014. It must have been 2013 when that tree top fell into the pond. We were home during an afternoon storm and we saw the top break off the tree and go sailing across the pond. Now we see more or less of it depending on the water levels. It is a very convenient photo prop, because birds that land there are so noticeable from a distance, whereas if they are wading around the shoreline, they are harder to spot and harder to focus on.